The belief has been around for decades: Simplified, it is the practice of investing in the "Dogs of the Dow" -- or the 10 or so worst-performing stocks among the thirty included in Dow Jones Industrial Average -- at year's end for the coming year. A little more complex thinking suggests that perhaps these "blue chips" are toward the trough of their individual business cycle and should, under normal conditions, recover somewhat -- performance enhanced by a now increased dividend yield. Of course, that assumes that management felt no need to cut said dividend payout. Well, good news for those oddballs who both often thought about this kind of investment strategy but have never acted upon it -- and also have thought about buying the shares of International Business Machines (IBM - Get Report) . You folks will get the chance to invest in IBM for the second year in a row -- if you think it is a good idea. Just take a look at this stellar two-year performance. As one quickly sees, December 2018 has dished out a -24.8% performance from Big Blue. The name did find support at the 105 level, which believe it or not competes a round trip that began in early 2016. The shares now stand a rough 33% lower than they had at their early 2017 highs. In fact, a success story is not how one would describe the past seven or eight years for this name. After a number of fits and starts, some seemingly successful, others clearly not, the firm in late October announced the $34 billion acquisition of Red Hat (RHT - Get Report) in order to profit from the planet's move toward cloud computing. In mid-December, Red Hat missed third-quarter expectations for revenue, while beating EPS expectations. 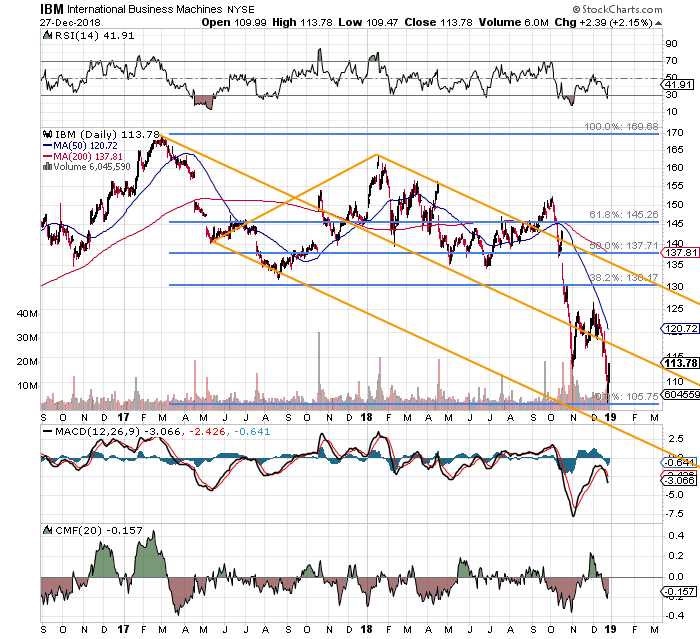 Did IBM pay too much for RHT? You be the judge. IBM trades at 8x forward-looking earnings for a reason. The firm runs with a number for total debt more than 3x the cash and equivalents that the firm has on hand. Profit margins are unspectacular. Industry consensus is for slight revenue contraction from FY 2019 into FY 2020. I started writing this segment as a trade idea based on a 'blue chip" firm that would likely not underperform yet again, based on the two year chart. I have talked myself out of it. Buying the dogs of the Dow? Not generally a bad idea, especially if one thinks the trade war gets ironed out amicably. Maybe just stick to Caterpillar (CAT - Get Report) , Goldman Sachs (GS - Get Report) , and 3M (MMM - Get Report) .